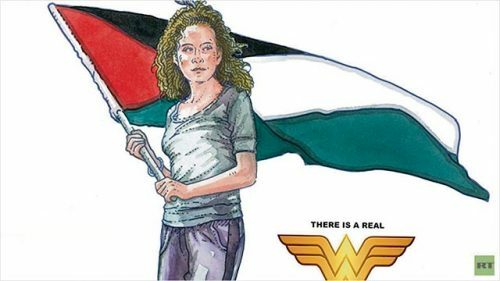 Irish artist Jim Fitzpatrick, who created the world famous image of Che Guevara in 1967, has given the same heroic treatment to teenage Palestinian protestor Ahed Tamimi, 17. The actress who plays the DC Comics heroine is Gal Gadot, a former Israeli soldier. Said Mr Fitzpatrick: “I became aware of Ahed Tamimi about two years ago and I was kind of struck by this girl standing up to Israeli soldiers. “In the meantime, I have a lot of Palestinian friends and I was getting quite disturbed as they told me her village was under attack. “In the course of all this, her 17-year-old cousin [Musab Firas al-Tamimi] was shot in the head and killed. It’s very disturbing when it’s such young people, and I thought ‘She’s next’, there can be no doubt about it. “FitzPatrick told the Russia Today website RT.com: “It’s a political statement of course, but it’s much more important than that. “It’s my effort to raise awareness that they can’t simply kill this girl. Given that Wonder Woman is in the news and Gal Gadot is an ex-Israeli IDF, I thought, ‘There is a real Wonder Woman, and it’s this kid’.